Trump discovers pharma lobbyists not part of the Washington “swamp,” but its victims. I think a lot of industries are going to be coming back [to the U.S.]. We have to get our drug industry coming back. Our drug industry has been disastrous. They’re leaving left and right. They supply our drugs, but they don’t make them here. To a large extent. And the other thing we have to do is create new bidding procedures for the drug industry because they’re getting away with murder. Pharma has a lot of lobbies, a lot of lobbyists, and a lot of power. And there’s very little bidding on drugs. We’re the largest buyer of drugs in the world, and yet we don’t bid properly. And we’re going to start bidding and were going to save billions of dollars over a period of time. 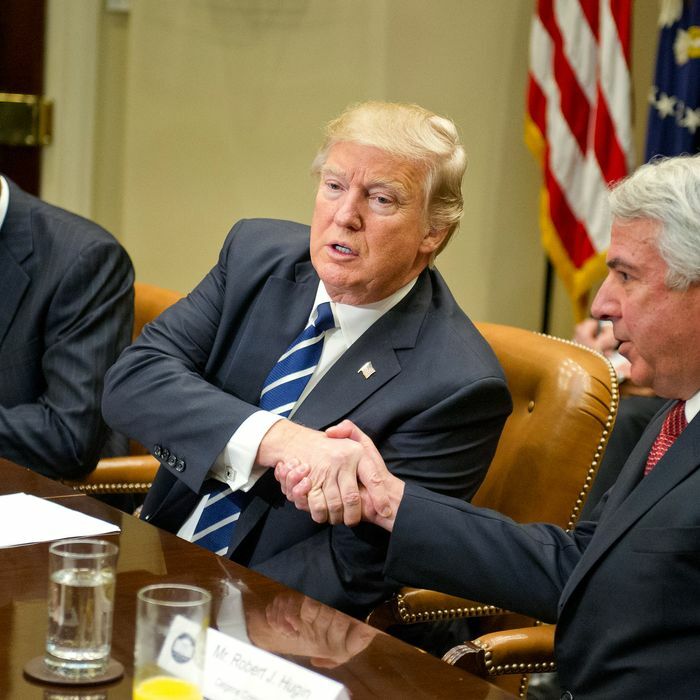 Trump promised to slash regulations, get new treatments to market faster at the Food and Drug Administration, and increase international competition. “We’re going to streamline FDA; we have a fantastic person” that will be announced to lead the agency soon, Trump said. He also promised to cut taxes on business and lure companies back to the U.S.
Investors responded positively to those comments, and the Nasdaq Biotechnology Index was up 1 percent at 10:07 a.m. in New York, while the Standard and Poor’s 500 Pharmaceuticals, Biotechnology & Life Sciences Index rose 0.8 percent. “Price-fixing” is precisely how pharma and its conservative allies describe Medicare negotiations for better drug prices. It sure sounds like Trump heard pharma’s talking points and adopted them. On most of the big public policy issues of the day, Trump is a very conventional Republican. And on those issues where he hasn’t been conventional, Republican Congress members and business executives feel confident they can turn him around. On some issues, they probably won’t. But on this issue, it seems like they did. That belief, if it’s even partially true, is an enormous asset for those who want to tame the populist beast and turn Trump’s perpetual fury away from GOP-leaning business lobbies and toward anyone who wants to use government to solve problems other than insufficiently enormous corporate profits. Just send in some execs with some GOP pols and maybe you can turn the Boss around on nearly anything you don’t like! You know, silly stuff like “draining the swamp” in Washington.